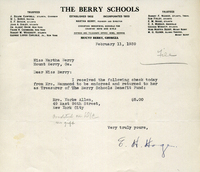 A check for $5.00 to be sent to Mrs. Hammond so it can be put in the Berry Schools Benefit Fund. 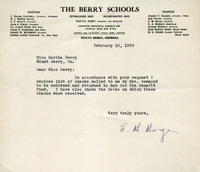 In this letter E.H. Hoge tells Martha Berry that he has enclosed a list of the checks sent to him from Mrs. Hammond. 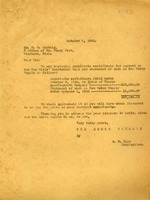 He said he also enclosed the date in which the checks were received. This is a list of the people who donated and the amount they donated to the EVH Scholarship Fund. 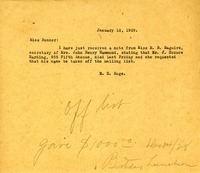 Letter from E.H. Hoge to Miss Bonner informing her that Mr. J. Horace Harding has died and to remove him from the mailing list. 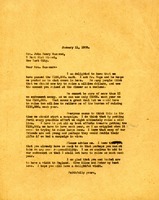 Berry reports on fundraising and seeks Hammond's advice about starting a campaign. 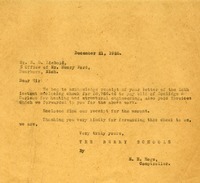 A letter detailing the budget costs for certain projects that have been done to the Berry Schools. 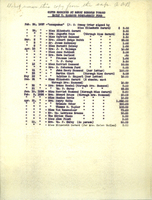 Hoge sends a receipt to Henry Ford's office for the work on the drives around the new buildings on campus and asks for a check for that amount ($20,648.35). 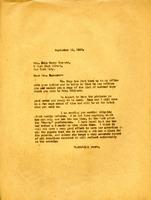 Letter discusses how correspondence with the Carnegie Corporation has been handled. 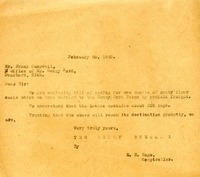 Letter also discusses how a fall meeting with the Corporation may be held during the winter. 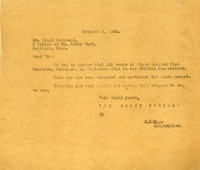 E.H. Hoge, Comptroller for the Berry Schools, encloses architects certificate for payment on New Girls' Recitation Hall and statement of work on New Water Supply to the office of Mr. Henry Ford. 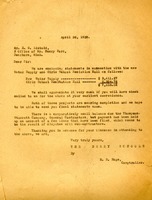 E.H. Hoge, Comptroller of the Berry Schools, acknowledges receipt of check for payment of balance on the Girls' Recitation Hall. 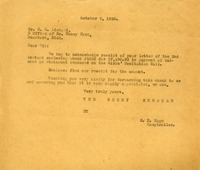 E.H. Hoge, Comptroller for the Berry Schools, acknowledges the arrival of a shipment of 100 sack of flour shipped from Dearborn, Michigan.